Upon researching some cheap gym memberships within the 5 boroughs I came a pdf that might interest Graduate Center students that are looking to join a gym. According to the membership information page from Baruch College’s Athletics & Recreation Complex website, students can use the facilities within the Complex between September 1st and August 31st for only $100. If you aren’t a student at the Graduate Center fear not! — CUNY faculty members can also join the Complex for a discounted rate of $400 per year. Compared with other gym membership prices this seems totally reasonable. 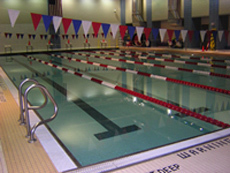 So if you decide to join Baruch’s Althletics & Recreation Complex keep a look out for me swimming laps! !